Cybersecurity Action Plan Between Public Safety Canada and the Department of Homeland Security. help Emergency Management Consultative Group members and others better understand each country’s policies on providing and receiving emergency assistance. Statement of Intent Between the Department of Health of Canada and the Department of Energy of the United States of America Regarding Nuclear and Radiological Emergency Management and Incident Response Capabilities. Additionally, this revised edition continues to introduce new terms, update web links and reflect organizational changes in both countries in order to ensure they reflect contemporary developments in the field of emergency management. We believe that this revised edition builds from the original text, strengthening the document's relevance to the emergency management system in both Canada and the United States. This Compendium should be regarded as a work in progress, and suggestions may be sent to ps.interoperability-interoperabilite.sp@canada.ca or fema-international@fema.dhs.gov. Canada and the United States have mutual interests in partnering in emergency management due to a shared physical border. Major emergencies and disasters in Canada and the U.S. could seriously affect the health, safety and security of citizens in both countries. Cooperation between the two countries on emergency management was first formalized in 1986 by signing the Agreement Between Canada and the Government of the United States of America on Cooperation in Comprehensive Civil Emergency Planning and Management. The Agreement was updated in 2008 with the signing of the Agreement between the Government of Canada and the Government of the United States of America on Emergency Management Cooperation. Pursuant to this Agreement, the Emergency Management Consultative Group (EMCG) was established in 2009. Since its inception, the EMCG has significantly contributed to the ability of Canada and the U.S. to prepare for, prevent, respond to, and recover from emergencies. The EMCG has overseen several joint projects that have increased cross border cooperation on a full range of emergency management and national security issues. 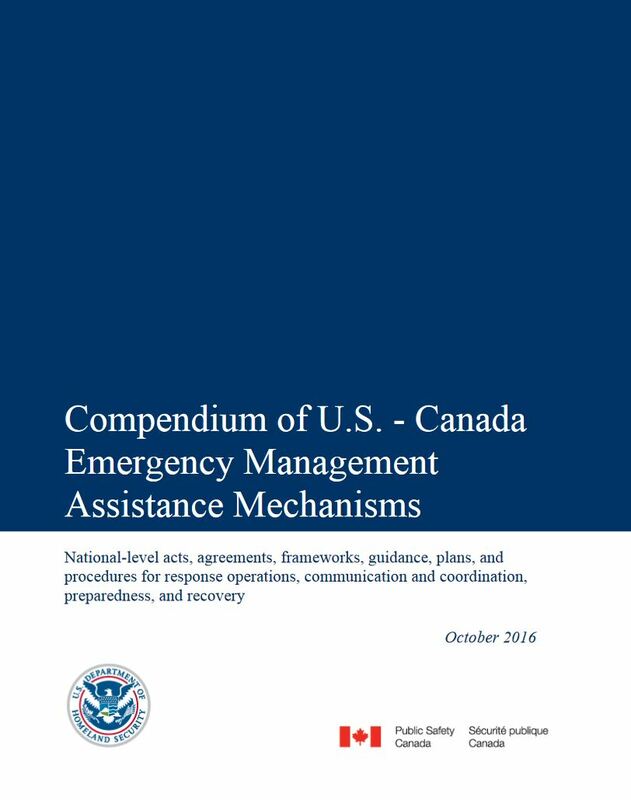 One of the key initiatives under the EMCG was the development of the Compendium of U.S.-Canada Emergency Management Assistance Mechanisms summarizing national-level acts, agreements, frameworks, guidance, plans, and procedures for emergency preparedness, response and communications, and recovery. The main purpose of this Compendium is to provide a broad picture of Canada and U.S policy and regulatory frameworks in the area of emergency management. This Compendium focuses on the national federal level and does not currently include provincial, state, regional and/or local level arrangements. Information contained herein provides only a brief summary and may not account for more detailed provisions, policies, operating plans and procedures under the mechanisms identified or that may be developed. Date Established – date or timeframe established, in effect, etc. Hazard Type – e.g., all-hazards, forest fire, HAZMAT (hazardous materials), etc. Scope/Function(s) – description of what the act, authority, agreement, framework, plan, policy, procedure, or program does, or provides for. Lead Organization(s) and Contact(s) – the Ministry, Department, Agency, etc. responsible for overseeing or implementing the act, authority, agreement, framework, plan, policy, procedure, or program and general organizational unit contact information, if available. Activation and Implementation – a description, where applicable, on how an act, authority, agreement, framework, plan, policy, procedure, or program would become “activated” or initiated and then implemented, resources requested, commanded, controlled, and de-activated, for the purpose of Canada-U.S. emergency assistance. Communication and Coordination – e.g., How are border authorities notified? How is a common operating picture achieved and maintained? Do resource typing standards and credentials, standard equipment lists, standard operating procedures exist to ensure that needs are communicated and met appropriately? Administration and Liability – (if applicable), e.g., What powers, duties, rights, privileges, and immunities is the mutual assistance afforded? How is the assistance insured? What financial compensation arrangements exist? Are resource qualifications and certifications, licenses, and permits addressed? Sec. 607 authorizes an agency of the United States Government to furnish services and commodities to foreign government international organizations and registered non-voluntary non-profit relief agencies on a reimbursable basis. The statute requires a determination that the activity is in furtherance of the purposes outlined in Part I of the Foreign Assistance Act (FAA). Agencies that seek section 607 determinations from the U.S. Agency for International Development may also use the section 627-630 authorities in providing services to foreign governments and international organizations. The Stafford Act constitutes the primary general statutory authority for most U.S. Federal preparedness, mitigation, response, and recovery activities for domestic disasters, especially as they pertain to FEMA activities. The Stafford Act makes the following references to “neighboring countries” defined as Canada and Mexico, in Title VI – Emergency Preparedness. Pursuant to Sec. 611 of the Stafford Act, “With the approval of the President, the Director [now Administrator of FEMA] may delegate to other departments and agencies of the Federal Government appropriate emergency preparedness responsibilities and review and coordinate the emergency preparedness activities of the departments and agencies with each other and with the activities of the States and neighboring countries.” In the Stafford Act, the term “neighboring countries” refers to Canada and Mexico. Pursuant to Sec. 621 of the Stafford Act, which describes administrative authority, the Administrator of FEMA “may employ not more than 100 part-time or temporary advisory personnel (including not to exceed 25 subjects of the United Kingdom or citizens of Canada) as the Director considers to be necessary in carrying out the provisions of this title. The Stafford Act is a U.S. domestic authority covering the fifty (50) States, the District of Columbia, Puerto Rico, the Virgin Islands, Guam, American Samoa, and the Commonwealth of the Northern Mariana Islands. Hence, the Stafford Act cannot be activated to provide U.S. Federal Government level emergency assistance to Canada. The Emergency Management Act (EMA) sets out broad responsibilities for all federal ministers across the full spectrum of emergency management. This includes prevention/mitigation, preparedness, response and recovery, and critical infrastructure protection. The Act reinforces efforts for Canada to be well-prepared to mitigate, prepare for, respond to and recover from natural and human-induced risks to the safety and security of Canadians. In consultation with the Minister of Global Affairs Canada, the Minister may develop joint emergency management plans with the relevant United States’ authorities and, in accordance with those plans, coordinate Canada’s response to emergencies in the United States and provide assistance in response to those emergencies. The Minister of Public Safety Canada is responsible for exercising leadership at the national level relating to public safety and emergency preparedness. In fulfilling his/her mandate, the Minister of Public Safety may cooperate with other organizations and partners—federal departments and agencies, Provinces and Territories, non‐government organizations, the private sector, foreign states, academia and communities. Commits the United States and Canada to work together to manage the movement of goods and people across the border during and following an incident that contributes to significant border disruption and requires national level engagement (i.e., a terrorist attack, an incident that impacts Critical Resources and Key Infrastructure [CIKR] of national interest, a request for national-level assistance). The Maritime Annex is for managing the movement of vessels carrying goods and people between Canada and the United States during and following emergencies. Activated in the event of an incident that contributes to significant border disruption, requires national level engagement, and is one or more of the following scenarios: a terrorist attack or threat, an incident that impacts CIRKR of national interest, a request for national-level assistance. The Framework identifies the Deputy Secretary of DHS and Deputy Minister of PS Canada and their officials as leads for sharing incident information, communicating national priorities, and facilitating joint messaging, liaising with the U.S Department of States (DOS) and Global Affairs Canada (GAC). It complements the Joint CBP / CBSA Business Resumption Communication & Coordination Plan and annexes, a framework for communication between the two during a trade disruption or increase in security threat level in either country. Provides a framework for Canada-U.S. cooperation in response to marine pollution incidents threatening the inland or coastal waters of both countries, or major incidents in one country where the assistance of the neighboring country is required. Implementation of the plan is the joint responsibility of the Canadian Coast Guard (CCG) and the United States Coast Guard (USCG). The Plan is tested every two years through exercises. This plan divides the international boundary into five Regional planning areas and includes Regional Annexes that define the jurisdiction, roles and response procedures of regulatory and support agencies within each. Each Regional Annex also covers such topics as communications, reporting systems and points of contact. Provisions and procedures referenced in the plan and its geographic annexes are intended to supplement each country’s national response system and provide a “bridge” between the two systems. The plan addresses planning and preparedness, including exercises and training, operational concepts, including notification and coordinated response, funding, and reporting (Environment Canada, 2010). Section 403 of the Marine Plan indicates that “In the event of a harmful substance incident, a coordinated response may be activated or deactivated by verbal agreement between the CCG On-scene Commander and USCG On-scene Coordinator.” Activation and deactivation are followed by written confirmation for which a sample form is provided. Geographic Annexes to the Marine Plan must include specific notification, activation and deactivation procedures. Geographic annexes to the Marine Plan must also include specific information on the response inventory available, a logistics plan, the integration of volunteers, a salvage and rescue resources inventory, and acceptable methods for disposal and decontamination. Liaison officers may be designated to facilitate information flow and support direct communications. Appendices to the Marine Plan provide national, geographic, and regional contacts. Geographic annexes to the Marine Plan must include specific procedures for customs and immigration clearances, a communications plan, a joint response team contact list, and public information coordination procedures. Funding is the responsibility of each Party and addressed in section 800 of the Marine Plan. Complements the 2009 Canada-United States Framework for the Movement of Goods and People Across the Border During and Following an Emergency. Plan and process for when a major emergency (such as threat to national security) occurs that contributes to significant border disruption and requires national level engagement. Outlines a triage methodology and process to assist the Government of Canada to establish which people and what goods are most urgently needed in Canada and manage the movement from the United States into Canada as quickly as possible. Also includes a Canadian whole of government view of stakeholders and communications mechanisms between governments and industry. Activated in the event of an incident that contributes to significant border disruption, requires national level engagement, Federal Emergency Response Plan and related Emergency Support Function(s) are activated, Director General Border Management Group (co-led by PS Canada and CBSA concurrence) and is one or more of the following scenarios: terrorist attack, increase in security alert levels, pandemic, natural disaster. Jointly coordinated by PS Canada and CBSA as co-leads of the Plan and the Director General Border Management Working Group. Outlines a Stakeholder Engagement and Public Communications Strategy which facilitates outreach in support of the Plan between federal departments, agencies, provincial authorities, Government of the United States, industry stakeholders, media and the Canadian public. Also commits the Director General Border Management Working Group (comprised of federal departments/agencies) to work together, coordinate, triage, communicate with industry stakeholders and ultimately make recommendations to Assistant Deputy Minister Emergency Management Committee regarding which urgently required goods/people should move to, through and away from the border based on the collective needs of the country. Will make best efforts to provide fair consideration to all applicants who complete and submit an application for priority assessment based on the nature of the emergency, Canada’s overall requirements and any other criteria that may be relevant. Bears no liability for any adverse consequences economic or otherwise that are perceived to be a result of a negative priority assessment. Obligation of applicants to complete and submit applications for priority assessment in full and in a timely manner. Pollution incidents threatening 15.5 miles (25 kilometers) of the inland boundary on either side. Provides for a cooperative mechanism for preparedness for and response to pollution incidents that cause, or may cause, damage to the environment along the inland boundary or may constitute a threat to public safety, security, health, welfare, or property. The Inland Plan may also facilitate the provision of assistance when only one country is affected, but the pollution incident is of such magnitude to justify a request for assistance from the other country. The combined inland boundary of New Brunswick with Maine -- CANUSEAST. Section 501 of the Inland Plan may be activated by the Regional Joint Response Team (RJRT) Co-chair from the country of origin of the significant pollution incident, after consultation with and consent from the RJRT Co-chair from the other country and both International Joint Advisory Team (IJAT) Co-chairs. This activation would take place if the pollution incident is accompanied by a substantial threat of the spread of a pollutant into the inland boundary of the other country or such spreading has already occurred, or if the pollution incident is of sufficient magnitude to justify a request for assistance from the other country. The appropriate RJRT Co-chair may activate the Inland Plan through a telephone message. The telephone message is to be followed by a written activation message (fax or email). The standard format for the written activation message as well as the activation diagram can be found in Appendix F.
preparedness and response measures between Canada and the United States with respect to significant pollution incidents along the inland boundary. In addition, it addresses notification, activation, and deactivation procedures. Sections 600 and 700 address situation reports and public information. A diagram of the Binational Concept of Operations can be found in Appendix B. Procedures for customs and immigration clearances for response resources are outlined in each Inland Plan Regional Annex. To facilitate mutual assistance in wildland fire between Canada and the United States. Requests for assistance under the operating plan are carried out through the countries respective Coordinating Authorities, the NICC and CIFFC. The operating plan addresses requests for assistance, designating officials, information to supply to Customs & Immigration Points of Entry (POE), and information to include in situation reporting. The operating plan also includes a “Directory of Designated Officials,” updated annually. In the U.S., Pub. L. 101-11, the Wildfire Suppression Assistance Act permanently authorized the Secretary of Agriculture and the Secretary of the Interior to enter into agreements with foreign fire organizations for assistance in wildfire protection. The CAP can (may) be activated and implemented upon direction by the Government of Canada and the U.S. President or Secretary of Defense. Annex A addresses requests for assistance and task organization. Annex C provides a concept of operations detailing phases and triggers and major actions for the phases. Annex D addresses the concept of logistics support, including levels of supplies. Annex D addresses logistics and engineering; Annex E discusses personnel. Annex F provides a public affairs concept of operation, while annex J describes command relationships. Annex K addresses communications and information systems. Geospatial information and services are addressed in Annex M, and Annex Q describes medical services. Annex A addresses task organization including tactical control of supporting forces. Annex C addresses operations including specialized military capabilities, emergency management, and regional emergency management. Outlines how Canada, Mexico and the United States intend to work together to prepare for and manage animal and pandemic influenza in North America. The Plan is intended to complement existing national emergency management plans and build on international principles. The Public Health Agency of Canada (PHAC) and U.S. Department of Health and Human Services (HHS) are the lead Federal organizations for animal and pandemic influenza preparedness and response. The plan identifies key Federal organizations within each country. The plan also identifies basic structure and mechanisms for trilateral emergency coordination and communication. The plan discusses the international legal framework for coordination to protect against and control the spread of disease. Provides the framework for communication between the two agencies to facilitate legitimate trade and travelers during a trade disruption or increase in security threat level in either country. The BR CCP is not intended as a communication plan for crisis management, incident management, or business contingency. It is intended for the coordination of communications to facilitate the resumption of trade at POEs. Communication topics may include: reporting issues, external messaging to the trade community, statements to the media, updates to and from other government agencies, and joint information sharing. May be activated and used by mutual agreement at a local, regional, or national level. The BR CCP details roles and responsibilities and key information to share among designated points of contact at the Headquarters, Regional, and Field Offices levels. It also addresses communications continuity, infrastructure, and joint communications to external stakeholders for consistency in messaging. A supplement to the NRF, the ICSA provides guidance on carrying out responsibilities for international coordination in support of the U.S. Federal Government’s response to a domestic incident with international and diplomatic impacts and implications that call for coordination and consultations with foreign governments and international organizations. Responds to requests for information or support from foreign missions or U.S. federal agencies; when a U.S. domestic incident of any sort has major international implications or the potential for them. Department of State’s Executive Secretariat and its Operations Center establish a DOS Task Force to communicate with the DHS National Operations Center (NOC) and other U.S. Government Agencies, as appropriate. The DOS Task Force also provides U.S. Embassies/Consulates with instruction on advising other governments and organizations on the domestic incident, and provides support to foreign missions and foreign nationals in the United States. DOS also serves as an intermediary for foreign requests/offers of assistance through the International Assistance System/Concept of Operations Plans CONOPS. DOS develops incident-related public affairs strategies according to the NRF Incident Communications Emergency Policy and Procedures described in the Public Affairs Support Annex and the Emergency Support Function #15 – External Affairs Annex. The Federal Nuclear Emergency Plan (FNEP) is an annex to the FERP. The FNEP provides supplemental and specific multi-departmental and inter-jurisdictional arrangements necessary to address the health risk associated with a radiological or nuclear domestic and international emergency. The FNEP supports rapid mobilization of federal radiological assessment and other specialized capabilities to manage the potential health risks associated with a radiological or nuclear emergency. The plan defines specific roles and responsibilities of federal response organizations for nuclear emergency functions, and linkages between federal and provincial/territorial emergency management organizations which can be initiated on a 24 hour, 7 day basis. In the event of a radiological or nuclear emergency requiring a coordinated Government of Canada response, the Minister of Public Safety will be responsible for overall federal coordination on behalf of the Government of Canada unless otherwise specified. The response framework established under the FERP will be supplemented by some, or all of the specific provisions contained in the FNEP in order to integrate and coordinate the scientific and technical capabilities of federal partners and to address the specific radiological consequences of the emergency. In the event of a nuclear emergency occurring abroad, elements of the FNEP may be implemented in support of the emergency response coordinated by Global Affairs Canada for the protection of Canadians and Canadian interests abroad, the management of Canada’s diplomatic and consular relations and the conduct of bilateral and multilateral relations. For incidents involving nuclear powered vessels from foreign armed forces in Canadian ports, the Department of National Defence/Canadian Armed Forces (DND/CAF) will act as the Canadian on-site authority. Coordination with the government of the United States of America during a nuclear emergency impacting both countries will be consistent with the principles and measures contained in relevant international conventions and bi-lateral agreements. Where existing bilateral agreements permit direct communication, provision of mutual aid, or liaison between organizations in Canada and United States, provincial/federal authorities will inform the Government Operations Centre (GOC), the FNEP-Technical Assessment Group and Global Affairs Canada of consultations with their United States counterparts during a nuclear emergency. Consultations, commitments, or decisions taken among organizations in direct contact will not exceed the scope of the relevant agreement(s) and will be coordinated with the appropriate Canadian authorities. Health Canada administers the FNEP and has the authority to initiate the arrangements described herein in support of Federal, Provincial or Territorial partners and international organizations. The decision to escalate the response level of the FNEP rests with Health Canada but will generally be done in consultation with Public Safety Canada/Government Operations Centre, the Canadian Nuclear Safety Commission (CNSC) as the federal regulator of the nuclear industry, and/or the DND/CAF for events involving nuclear-powered vessels. Health Canada may also consult other federal government institutions as appropriate. Establishes, given the interconnectedness of U.S. and Canadian critical infrastructure, a comprehensive cross-border approach to critical infrastructure resilience. It identifies specific deliverables, provides a framework for managing risks, and supports regional cross-border relations. The Action Plan is based on three objectives, building partnerships, improved information sharing, and risk management. A variety of specific actions are identified to support each. Specific communication and coordination actions include working together to improve sector-specific cross-border collaboration, establishing a virtual Canada-U.S. Infrastructure Risk Analysis Cell, developing compatible mechanisms and protocols to protect and share sensitive critical infrastructure information, collaborating to ensure effective information sharing during and following an incident, among others. Establishes lines of communication and areas for collaborative work critical to enhancing the cybersecurity preparedness of both Canada and the U.S. The Action Plan provides a shared approach to fulfill PS' and DHS' vision of working together to defend and protect our use of cyberspace and to strengthen the resiliency of both nations. The Action Plan outlines three goals for communication and coordination: collaboration between PS and DHS at the operational and strategic levels; information sharing with the private sector; and, continued cooperation on ongoing cybersecurity public awareness activities. Entered into force July 7, 2009. Supersedes the 1986 Agreement between the Government of Canada and the Government of the United States of America on Cooperation in Comprehensive Civil Emergency Planning and Management, which superseded the Canada-United States Agreement concerning Civil Emergency Planning from 1967. This agreement establishes a Consultative Group on Emergency Cooperation between Canada and the United States. This Group is provided broad authority to work on emergency management topics affecting both the United States and Canada including those involving mutual aid. Subject to domestic laws, the agreement also identifies general principles of cooperation, as a guide for civil emergency authorities. These principles include using best efforts to facilitate the movement of evacuees and emergency personnel and equipment, avoiding levying Federal taxes on services, equipment and supplies engaged in emergency activities in the territory of the other, etc. This is a standing agreement that does not identify any specific activators. Principles to support the implementation of emergency activities are identified. The agreement contains no specific procedures for communicating and coordinating among the parties for Federal level mutual assistance. The agreement does not address administration or liability for Federal level mutual assistance. The MOU establishes a framework for cooperation among the Participants for the provision of search and rescue (SAR) services in response to a maritime or aeronautical incident within the Participant’s search and rescue region. A Participant may enter onto or over the territory of another Participant country for the purpose of rendering emergency rescue assistance to persons, vessels, or aircraft. Notification of such entry must be made as soon as practicable. Operational MOUs and procedures among the Participants exist under this MOU. SAR operations are carried out in accordance with relevant SAR manuals and recommendations of the International Civil Aviation Organization and the International Maritime Organization. Cooperation is addressed in section six of the MOU and includes providing services in support of SAR operations, developing procedures, techniques, equipment, facilities, and information systems, and joint training and exercising. Each Participant funds its own expenses for activities pertinent to this MOU. Assistance to save lives and reduce suffering is provided regardless of the nationality or immigration status of persons requiring rescue. June 18, 2009, and for the United States on June 17, 2009. Participants agree to facilitate vital civil cross border transport and transit in accordance with the MOU. The MOU is a multilateral tool that creates the general framework for the transport and transit of relief personnel and material from a sending Participant to a requesting Participant by water, land, or air to cope with the consequences of a disaster (e.g., a Chemical, Biological, Radiological or Nuclear [CBRN] event, accidental or other, natural or technical catastrophes). The Euro-Atlantic Partnership Council (EAPC) is the overarching framework for consultation among Participants. Activated through a request from one Participant to another, Annex 1 provides agreed-upon application, notification and coordination, logistics, border crossing, additional arrangements, etc. procedures and principles for the implementation of the MOU. It is understood that Participants may further conclude additional separate arrangements to identify practical and technical details for the facilitation of vital civil cross border transport. The MOU calls for each Participant to designate a national contact. Basic notification procedures are also identified for sending, requesting, and transiting Participants. Documents partnership between the DHS Office of Public Affairs and PS Canada. The two have developed a Canada-US Incident Management Framework for Public Communications with best practices for sharing public affairs communications materials and contact lists for use during exercises, national security incidents involving the United States and Canada, large-scale incidents, and international incidents involving international allies. This framework is tested annually through exercises and reviewed routinely. Utilized during exercises, national security incidents involving the United States and Canada, large-scale incidents, and international incidents involving international allies. DHS Office of Public Affairs and Public Safety Canada are each responsible for designating a first point of contact for the Memorandum, and are each further responsible for all costs of activities undertaken to support it. Establishes a vehicle for the conduct of cooperative scientific and technological research and development in the fields of critical infrastructure protection and border security. Areas of cooperative activity include threat, vulnerability, and risk assessments, interdependency analyses, detection and monitoring, training, test and evaluation, pilots and demonstrations through such means as joint research projects, task forces, studies, seminars, and working groups. Agreement addresses management, contracting, finance, intellectual property, entry of personnel and equipment and material, and security. Further communication and coordination procedures are established in specific Cooperative Activity Arrangements and subordinate Technical Annexes. Umbrella agreement creates no standing financial commitments. Parties to Cooperative Activity Arrangements and Technical Annexes bear or share costs of implementing activities. The MOU is to establish and utilize a standardized, web-based application interface between the Information Technology systems to facilitate the exchange of emergency messages within the production environment. The testing of the interoperability of these systems has been performed through the use of FEMA’s test and development environment to ensure the transference and receipt of emergency messages using approved messaging standards. This MOU becomes effective upon the date of last signature (June 6, 2016) and remains in effect until either (a) the Authority to Operate (ATO) for IPAWS- Open Platform for Emergency Networks (OPEN) or (b) three years after the effective date of this MOU. Both Participants intend to maintain open lines of communication between designated staff (indicated in Appendix B) at both the managerial and technical levels. All communications described herein must be conducted in writing and may be disseminated by electronic means unless otherwise noted. Detailed producers are addressed in section four of the MOU. This agreement creates no financial commitments. The FEMA- IPAWS Program Management Office is responsible for the costs associated with developing, operating and maintaining the availability of the IPAWS-OPEN system. Any funds, services or equipment provided to accomplish the goals anticipated under this MOU are done so without expectation of reimbursement or the payment of fees related to the provision of such services, equipment or personnel unless otherwise expressly determined by the Participants. The agreement is to share relevant information to improve immigration and border determinations, establish and verity identities of travelers, and provide immigration decision-makers enhanced information that will facilitate screenings at the earliest possible opportunity. It is intended to stop threats before they arrive in Canada or the U.S. and improving information available for visa determinations. This agreement was signed on December 13, 2012 and entered into force in November 2013. The agreement addresses requests for information such as when a third country national applies to the United States or Canada for a visa or claims asylum. Such a request would contain limited information, such as name and date of birth in the case of biographic sharing, or an anonymous fingerprint in the case of biometric sharing. If the identity matches that of a previous application, immigration information may be shared, such as whether the person has previously been refused a visa or removed from the other country. Under the agreement, information will not be shared regarding U.S. or Canadian citizens or permanent residents. Any information shared on travelers and asylum seekers will be handled responsibly and, as with other information sharing agreements, exchanged in accordance with relevant U.S. and Canadian laws. The MOU is to improve the mutual CBR defence capabilities of participants through greater cooperation in research, development, acquisition, doctrine, operations, and training of chemical, biological, and radiological defense. Establishes the terms and conditions under which the United States Geological Survey (USGS) will provide United States-owned land remote sensing satellite data and the Canada Centre for Remote Sensing (CCRS) will receive, process, archive, distribute, and exchange such data in cooperation with the USGS. This MOA consists of this main framework agreement and associated annexes relating to definition of terms, annual fees, as well as mission-specific activities. This MOA was entered into force on March 22, 2013 and remain in force through the operational lifetime of the USGS land remote sensing spacecraft(s) from which CCRS receives USOS land remote sensing data. This MOA may be amended by mutual agreement of the Parties. Annexed to the MOA is a concept of operation outlining protocols and processes for communication and coordination. Establishes the terms and conditions under which the U.S Geological Survey and the Canadian National Seismic Network will exchange Earthquake data between their respective systems. The Agreement was entered into force on Oct 1, 2008 and remains in force until either party requests a revision or termination to the Agreement. The purpose of the Statement of Intent (SOI) is to provide a framework for cooperation between the Department of Health of Canada and the Department of Energy of the United States to enhance radiological and nuclear security for major public events and minimize the actual or potential radiological consequences to health, environment and property of an incident involving nuclear or radiological material worldwide. This SOI entered into force on February 20, 2014. The participants to this SOI intend to communicate, or meet, at least twice per year, and more frequently as they jointly decide. The SOI calls each participant to identify a representative in matters related to the general administration of the SOI and conducted activities. Each participant funds its own expenses for activities pertinent to this SOI, in accordance with the national laws of its country. This SOI is not legally binding. Provides guidance to all U.S. embassy staffs on support from USAID/ OFDA before, during, and after the occurrence of natural disasters and complex emergencies abroad to ensure timely, appropriate, and effective U.S. Government emergency and humanitarian assistance. USAID/OFDA is the U.S. Government’s lead agency for providing international disaster and humanitarian assistance and coordinating the U.S. Government response to declared disasters in foreign countries. At each embassy, the Mission Disaster Relief Officer (MDRO) is the focal point for disaster-related information, planning, and activities affecting the host country. it is in the interest of the U.S. Government to provide assistance. The Chief of Mission can request from USAID/OFDA up to USD $50,000 for immediate disaster relief or rehabilitation. Deployment of USAID/OFDA regional advisors, an assessment team, or a Disaster Assistance Response Team (DART); provision of relief commodities from USAID/OFDA stockpiles; and additional disaster funding are supplementary USAID/OFDA capabilities that may be requested. Guidance on U.S. Government and host country communications and coordination are provided, as well as listings of USAID/OFDA contacts. A recommended public message concerning donations is also provided to embassy staffs in the guidance. The IAS does not address foreign offers of cash, offers to State, Tribal, or local governments, or offers from private sources. It also does not replace any bilateral agreements. Although designed to support FEMA in a Stafford Act response, the principles and procedures described in the IAS may be used as a guide to other U.S. federal response agencies for non-Stafford Act events. Involves DOS, DHS/FEMA, USAID/OFDA, Regulatory Agencies, and the U.S. Department of Defense (DoD). Activated by FEMA in extraordinary cases when the U.S. Government determines it is necessary to request or accept international offers of assistance for a catastrophic disaster response and if FEMA needs help managing the offers of assistance. The IAS is not automatically activated for every large domestic disaster. Upon activation, FEMA mission assigns DOS, USAID/OFDA, and DoD for further support. The IAS CONOPS addresses roles and responsibilities among U.S. departments and agencies, and identifies policies and procedures for communication and coordination. FEMA is authorized to accept international assistance through the IAS using its gift acceptance authority under the Stafford Act. The IAS CONOPS identifies workers’ compensation, liability, and credentials, licensing, and certifications as issues that must be addressed before service personnel may be accepted. “Maritime Threats,” defined in the U.S. MOTR Plan as “actionable knowledge of, or acts of, terrorism, piracy, and other criminal, unlawful, or hostile acts committed by foreign States and non-state actors, such as international terrorist groups. Provides a forum for the exchange of national level threat and event response information between national level frameworks. MERP-MOTR complements existing bi-national consultation mechanisms by providing a platform to rapidly assemble representatives from legal, diplomatic, customs, and the armed forces to securely exchange information related to maritime threats and events. The Protocol may be activated by either party upon the occurrence, or potential occurrence, of a significant maritime threat or event that could impact both Canadian and U.S. interests, or when a response by one nation to a maritime threat or event could adversely affect national level public affairs or strategic communications of the other nation. Each country is responsible for its own costs resulting from the implementation of the Protocol. The Protocol is not legally binding, does not affect the terms of any other agreement or arrangement in place between the parties, and is not intended to create any right or benefit by any third party enforceable against the participating agencies, their officers, employees, agents or associated personnel. A process between FEMA and CBP to facilitate the secondary “parole” entry of groups and individuals from Canada and other countries affiliated with the National Voluntary Organizations Active in Disaster (NVOAD) into the United States to provide voluntary services to non-governmental organizations in support of U.S. declared disaster recovery operations. Voluntary organization activates the process by providing a list of volunteers and other information to FEMA no later than one week prior to U.S. entry. FEMA verifies the information provided by the voluntary organization on the groups and individuals and sends a request letter to CBP. CBP reviews the information and forwards to the Point of Entry (POE) for consideration. Groups and individuals must be “credentialed” by the voluntary organization they represent. Tools and equipment being transported must be registered with CBP to ensure return to its country of origin. CBP vetting includes verification of proper travel documents, and submission of fingerprints and a photograph. The U.S. Immigration and Nationality Act provides Customs and Border Protection authority to parole aliens into the country on a case-by-case basis for urgent humanitarian reasons or significant public benefit. The Immigration and Refugee Protection Act (and related Regulations) establishes the eligibility criteria for any person seeking admission to Canada. Emergency repair personnel are persons whose admission is required in Canada to carry out emergency repairs to industrial or commercial equipment in order to prevent disruption of employment. They require a work permit and are exempt from requiring a labour market opinion under subsection 205(a) of the Immigration and Refugee Protection Regulations. Requesting company’s 24-hour contact number. Valid vehicle licence plate number. 3. Work Permit Information (required for emergency repair personnel only). Participation of public and private responders in the joint NEXUS program could expedite the cross-border provision of mutual assistance. NEXUS cardholders are pre-screened and approved for faster processing using trusted traveler lanes at airports, waterways, and land crossings. with floods and other disasters. In Canada, the Customs D-Memorandum D8-1-1, Temporary Importation (Tariff Item No. 9993.00.00) Regulation provides full relief from the payment of the customs duties, and the Goods for Emergency Use Remission Order (OIC 73-2529), provides full relief from GST/HST that would otherwise be payable on these goods. When time permits, a Temporary Admission Permit Form E29B will be issued covering all equipment and supplies. Carry two copies of the equipment list including serial numbers and monetary value. Stop at U.S. CBP prior to departure to get the equipment list stamped to assist in the re-importation of the goods back into the United States upon return. Present the list to CBSA for clearance approval. Stop and report to CBSA when leaving Canada so that temporary admission permits can be cancelled.